MADDINGTON’S Gary Herren can image the blood he has donated over the years would fill multiple 44-gallon drums. He and his family all celebrated milestone blood donations at the same time at the Australian Red Cross Blood Service Cannington Donor Centre last Wednesday. Mr Herren donated for the 250th time, while wife Anne donated for the 200th and daughter Louise Branch-Smith recorded her 25th donation. 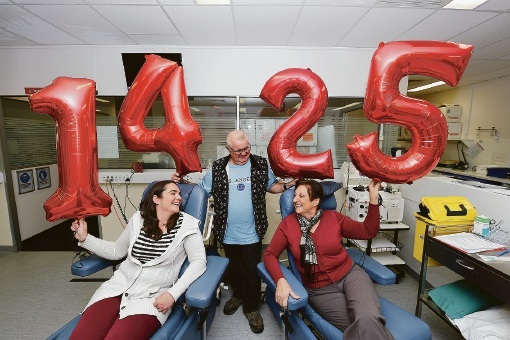 Together, the family has donated 475 times, which according to the Australian Red Cross Blood Service would help save 1425 lives. Mr Herren said the blood that he and his family donated would fill two or three drums. He said the process since he started donating back in the 1960s had become quicker. Ms Herren said it had just become part of her routine to donate blood and did not always think about where it went. “You see these adverts and you don’t realise what the blood does,” she said. Ms Branch-Smith (34) encouraged more young people to donate. “You just make it as part of your life,” she said. “I moved to the city and I have got children and it was nice to know there is help there if they ever needed it,” she said.